Living in a large city, it’s not uncommon to dream of escaping to the serene tranquility of the countryside. And is there anything more charming than an age-old thatched roof dwelling that looks as if it’s full of history and heritage? We certainly don’t think so, and this gorgeous farmhouse is certainly a stunner! Boasting an extensive brick exterior, this property blends old-world rustic character with modern amenities and comforts. With everything you might expect from a historic farmhouse, this dwelling is replete with fabulously engaging features and plenty of soul. As we peek at the exterior of this home, the raw red brick façade offers a sense of personality and charm, all the while enticing us with its rustic charisma. 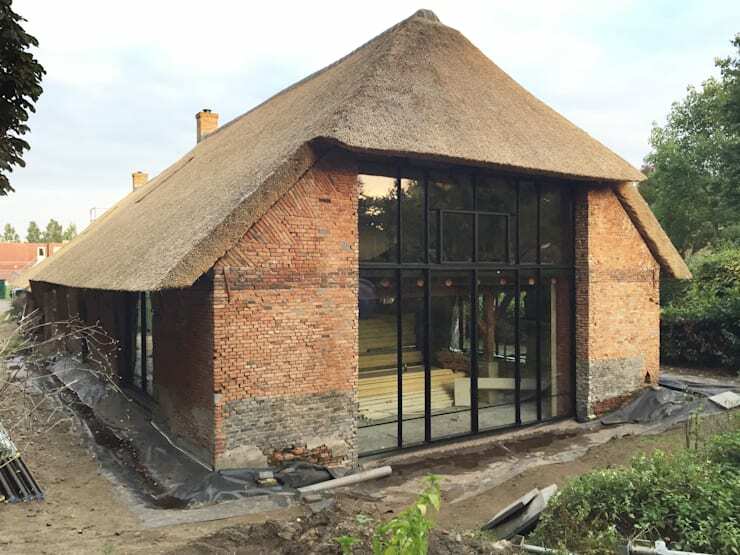 As well as the brick exterior, a thick thatched roof adds that quintessential European character, imparting distinctive vibes and a feeling of bucolic beauty. Perfectly provincial, as we move inside, you can see how the designers and architects have retained plenty of the original features within the dwelling. A work in progress, this house employs industrial touches, paired with rustic originality, and modern finishes. Although we are yet to see the completed version of this abode, it is clear that the interior will retain a sense of its heritage and originality. 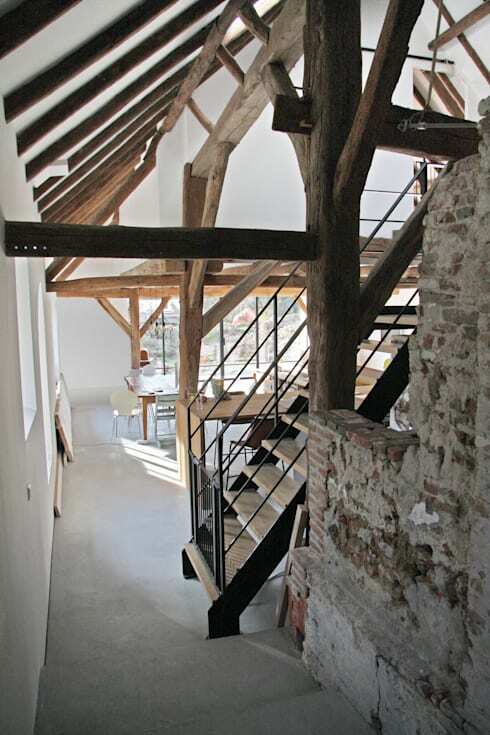 Exposed brick walls are yet to be rendered, and add a raw organic aesthetic. Preservation seems to be of particular importance to this home’s designers, who have employed a measured attitude when choosing which elements and features to retain, and which to modernise. As we head upstairs, we are able to see down to the contemporary cooking space. Here a white and timber colour scheme has been chosen, which reflects the overall palette within the home. From this vantage the modern kitchen offers an informal eating area, next to the more formal fining space. Additionally, the polished concrete floor juxtaposes itself against the warmth of the timber, conveying divergence and contrast. Moreover, the gorgeous arch windows have been retained, offering a vision of this home’s original aesthetic and aura. Instead of removing these windows and adding larger more modern alternatives, the architects have left everything original, which contributes an enchanting atmosphere and air. Although this home is not yet complete, we are able to witness plenty of the impressive interior features. 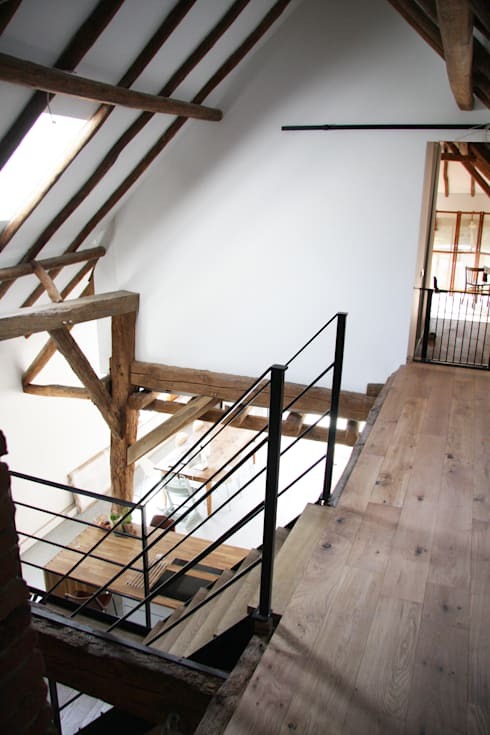 The vaulted ceiling is certainly one of these, and truly a cherished feature for farmhouse conversions. Exposed timber beams have been left bare and stripped back, while the stark white wall hue ensures they are not to be missed! Timber flooring is added to the upstairs space, which ensures warmth during the colder winter months, while the downstairs opts for a harder polished concrete. 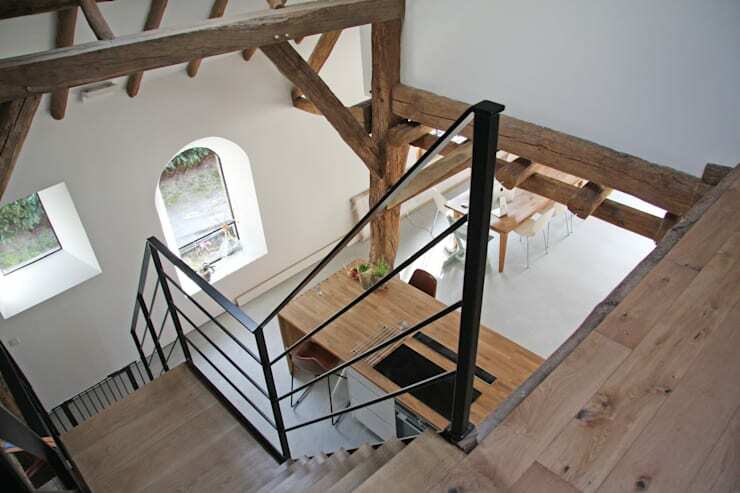 A true statement-making feature of the newly updated farmhouse, the staircase is a real eye-catching fixture. 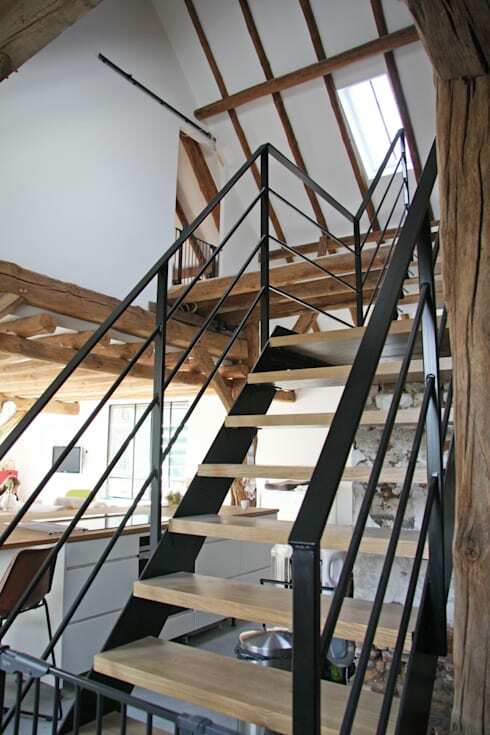 The powder coated black steel adds a sturdy and robust ambience, seamlessly contrasted against the plentiful timber additions. Balanced and thoughtful, this home takes an effortless approach to modernity, while paying homage to its traditional roots. Liveable, practical and stylish, we’re sure the dwelling will stand the test of time with age-defiance and poise. Would you like to escape to a gorgeous countryside farmhouse?